I just can't resist in donating to some stuff (yeah, I'm a sucker for such things), specially when there's some goodies involved (Kathy Sierra is definitively right on that matter ). 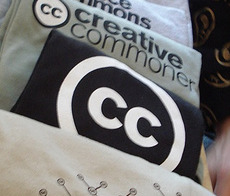 So, Creative Commons is running a donation campaign , and I've just decided to order a t-shirt to help'em. After all, what is 20€ compared to all that these guys are managing to do? So, more than telling you I've donated, this post is more about... don't you want to donate to CC ?